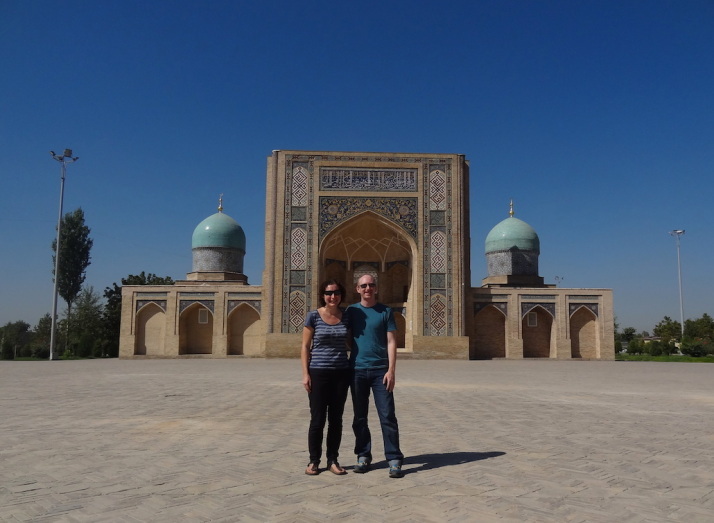 Uzbekistan is the first country either of us have visited in Central Asia. 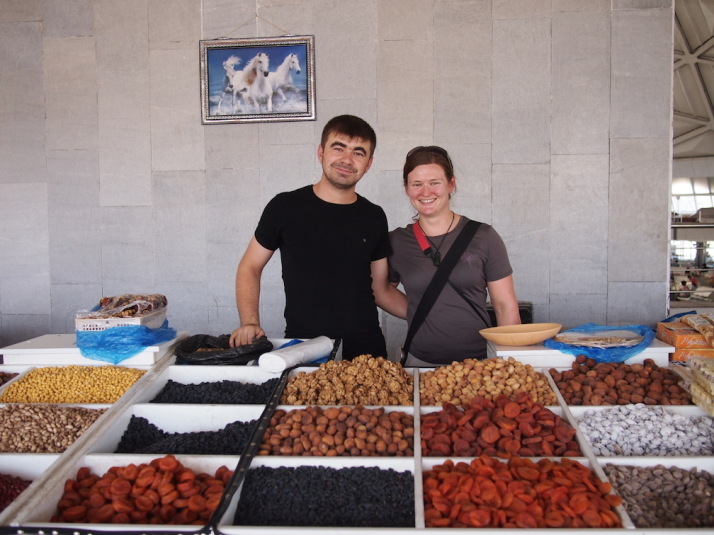 Why did we chose Uzbekistan? Well, we were looking for somewhere to visit enroute from China to Europe as we make our way homeward towards the UK, and as the old Silk Road went right through it we knew it would be steeped in history. More recently, it used to be part of the old Soviet Union which meant we could dust off the little Russian we already know while trying to pick up the odd word of Uzbek. 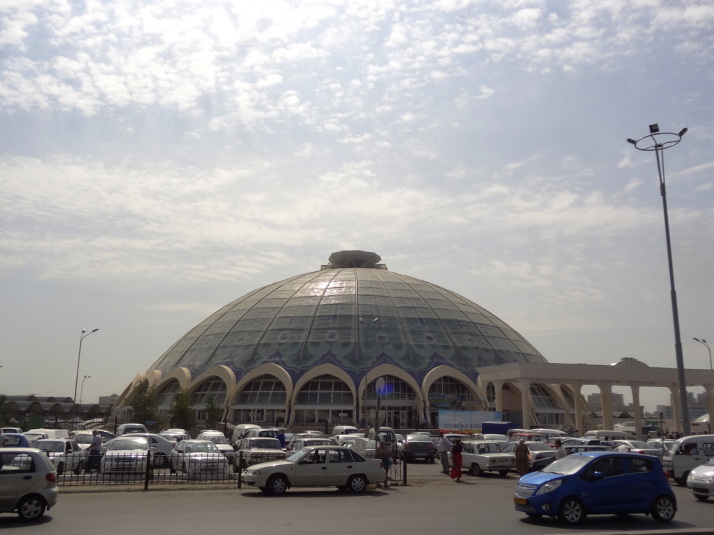 Chorsu Bazaar is the bustling heart of Tashkent. We love visiting markets anyway, so Chorsu was high on our list and after a few hours wandering through it, we think it’s a strong contender for the best market we’ve visited. 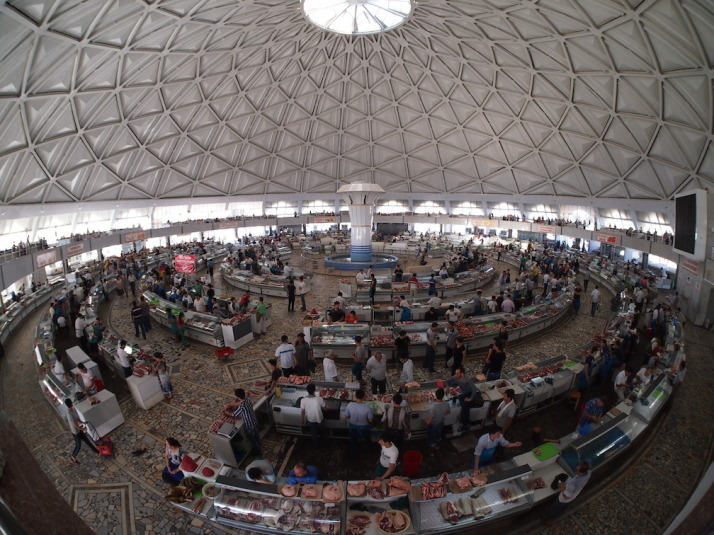 The icon of Chorsu bazaar is the wonderful turquoise tiled domed hall that sits in the north-west corner and houses the meat market. 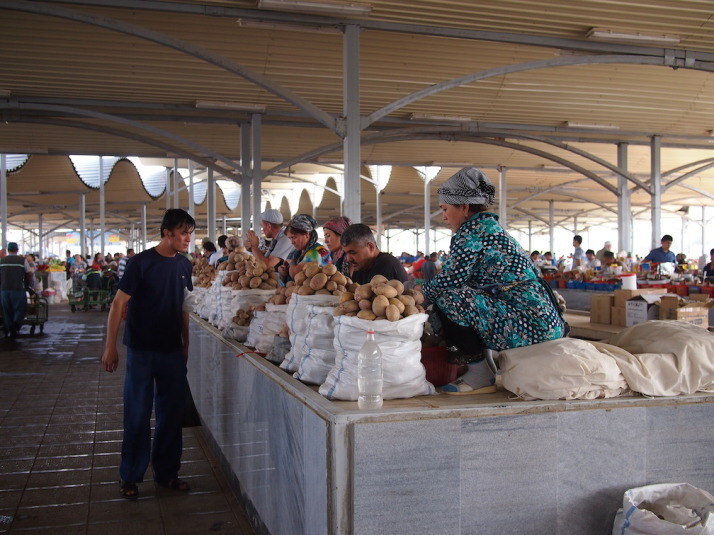 Outside, we found rows of rice and spice sellers, rows of beautifully ripe vegetables – including tomatoes the size of baking apples – and trucks full of melons and watermelons! Further, we found household goods, shoe repairs, a high street-like two storey row of clothing shops and stalls and a cafe area. It was then we realised the dome is but a fraction of the size of this sprawling hub of sights, smells, tastes and trades. There were echoes of our experiences in Bangladesh markets where the traders would beckon us over wanting their photograph taken or for us to pose with them! 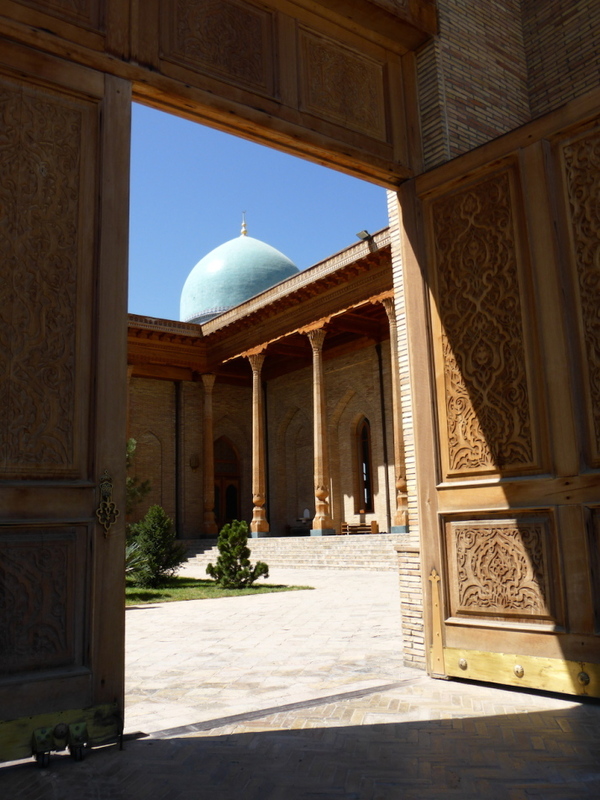 The Kulkedash Medressa is a welcome slice of serenity after the claustrophobic bustle of Chorsu Bazaar. Medressa translates as school, and is akin to our higher education or university system; students learn a wide syllabus of sciences and Islam. As well as teaching rooms and student accomodation, teachers have small offices and as we walked around a few of them were open. When we popped our heads around the door of the calligraphy room, the friendly gentleman inside came to the door and invited us in. 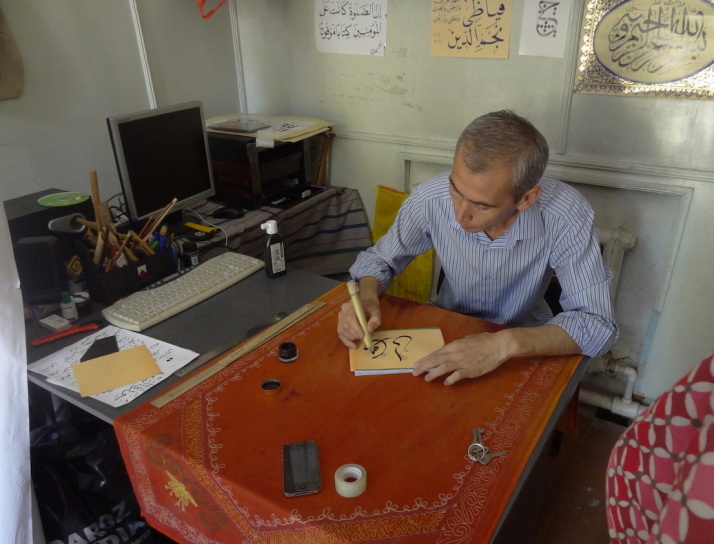 His English was excellent, and after he showed us the various styles of Arabic script, including a mosaic style used on minarets and diagonal diamond patterns, he wrote Julie’s name in Arabic on a scrap of paper! Born around 1330, Amir Timur is the Central Asian Chinggis Khan – regarded as a military genius and tactician who sought to reunify the great Khan’s empire, his Tirmurid dynasty extended from southeastern Turkey, Syria, Iraq, and Iran, through Central Asia encompassing part of Kazakhstan, Afghanistan, Armenia, Azerbaijan, Georgia, Turkmenistan, Uzbekistan, Kyrgyzstan, Pakistan, and bordered Kashgar in China. 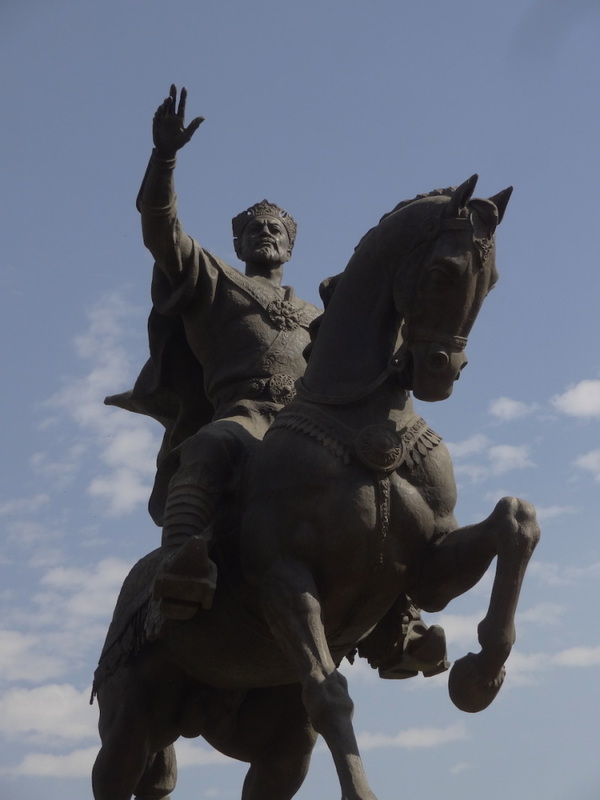 Today, he’s regarded as the national hero of Uzbekistan and his statue dominates Tashkent’s central square. It’s pretty much the only thing here save for a few fountains and as there’s little shade we didn’t stay for long. 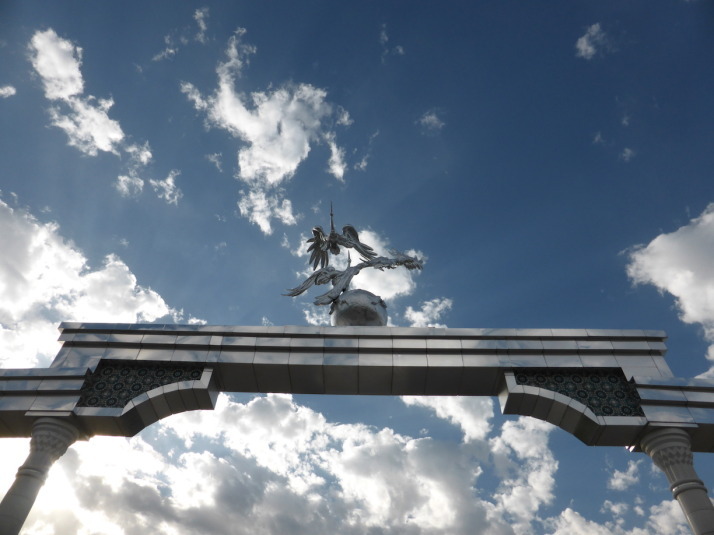 A couple of blocks away from Amir Timur is the country’s Independence Square, where fountains abound and giant square gates are adorned with silver pelicans said to bring good luck. 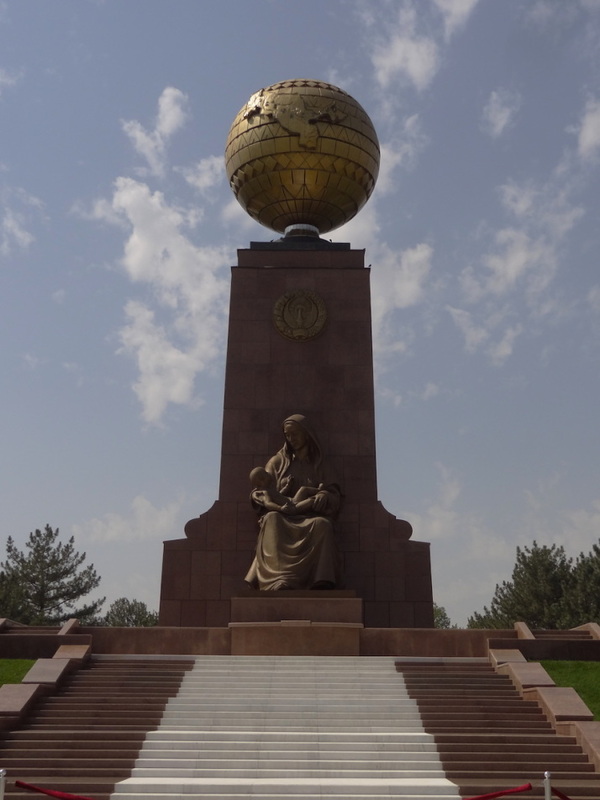 The independence celebrated here is from the former USSR, Uzbekistan was one of the first countries to declare their independence when the Soviet Union collapsed in 1991. 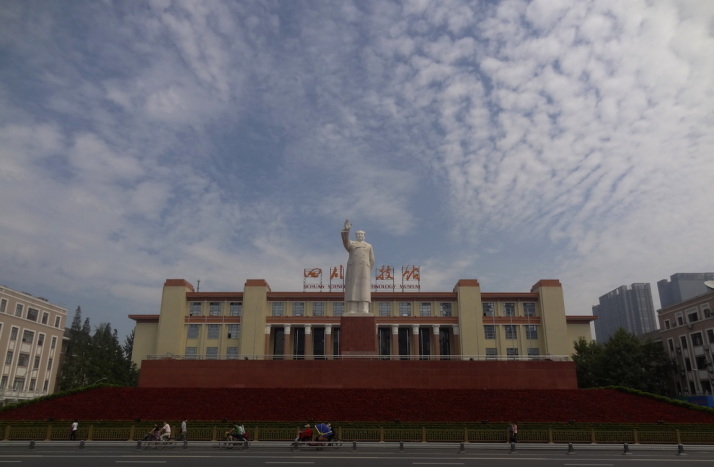 Facing us across the square is the giant statue of a Crying Mother who commemorates the 400,000 Uzbek soldiers who died fighting with the allies in World War II. Having such a imposingly powerful memorial here gave me a strange sense – perhaps it’s meant as a reminder that independence is hard won but worth fighting for. 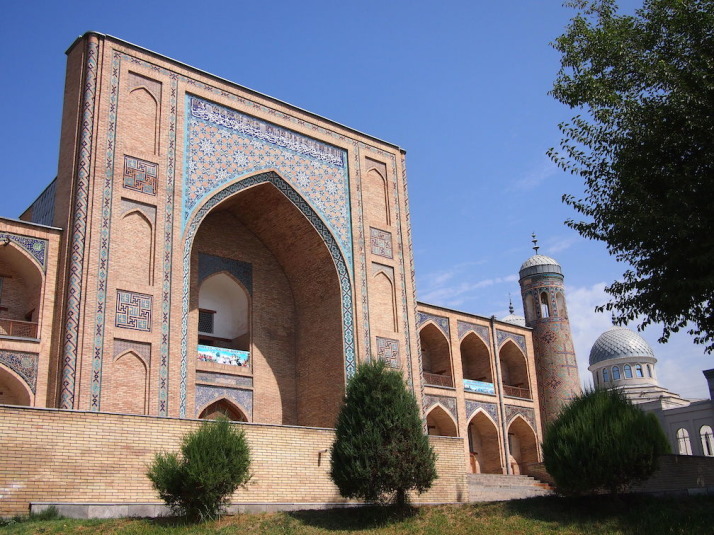 This is the official religious centre of Islam in Uzbekistan. To the east of the square is the Hazroti Imom Friday mosque, to the west is the Barak Khan Medressa which used to be a centre of learning until the student rooms filled up with souvenir stands. According to our guidebook there is a third building called the Moyie Mubarek Library Museum that houses the Osman Qur’an (Uthman Qur’an), the oldest known copy of the Qur’an. I thought it might be the small, squat building in the square, but Julie thought it was the grand, wooden pillar-fronted one to the north. We poked our heads into the latter to find what looked like a doctor’s waiting room, and received a very puzzled look from the handful of people sitting inside. We translated the sign on the outside and deduced it was, in fact, a family planning clinic! It took a bit more wandering before Julie decided that it might be worth a look in the small squat building in the square. The one with the short fence and the security box outside. We paid 6,000som each (about £1.20) to the guard inside the building, and taking centre stage, is reportedly the oldest Qur’an in the world. 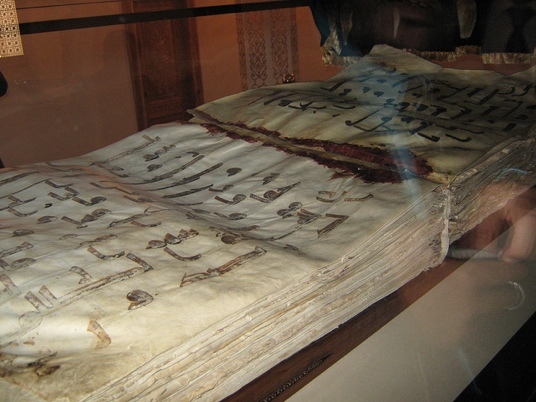 Its pages are about a foot square, made from deerskin and written in old Arabic script. Even with a few pages missing, it weighs about 40kg. Our guidebook tells us a little of its history.. The library has many more examples of the Qur’an, including a couple of tiny ones with pages smaller than postage stamps, and a display of translations into different languages. 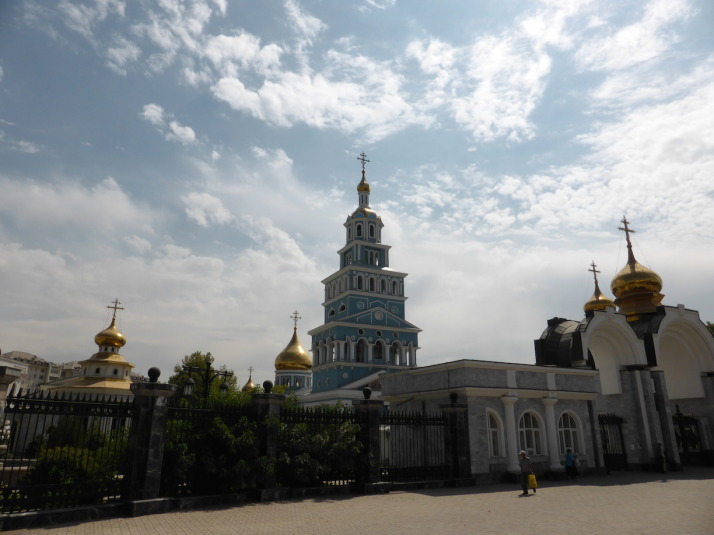 Like any capital city, Tashkent has a good number of museums though most get lukewarm write-ups and of the ones we decided to visit we found the quality was a little variable. 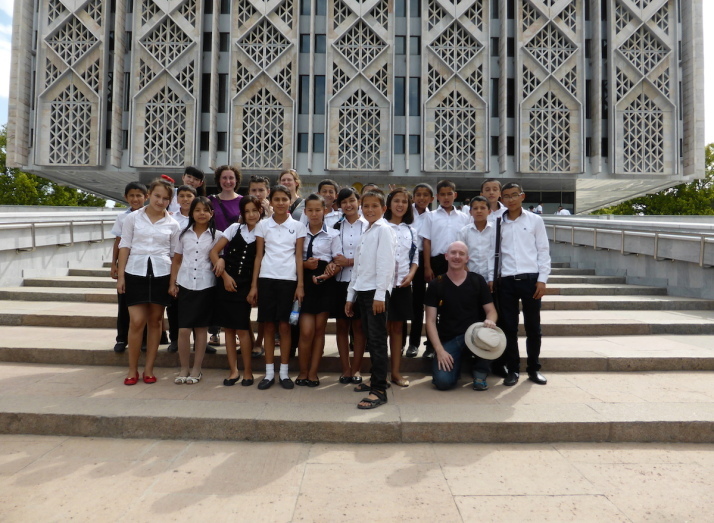 First up was the Fine Arts Museum of Uzbekistan which we really enjoyed. 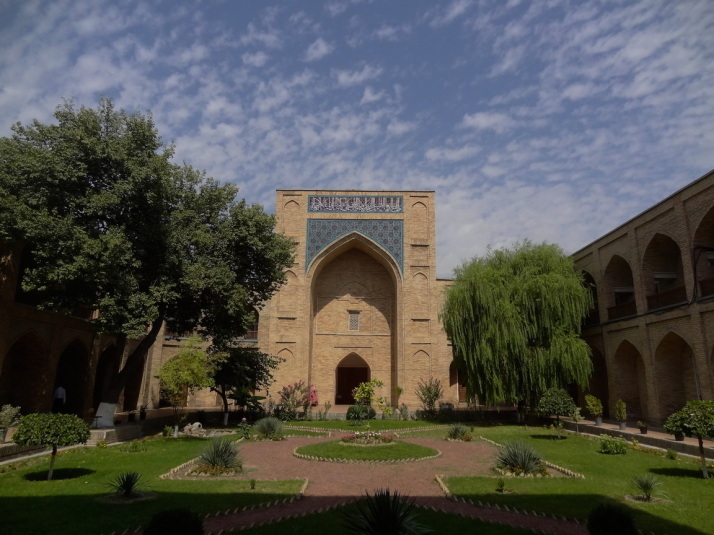 Each of the 4 floors are partitioned into small, easily digestible rooms and the whole place is chronological from the ground up, starting with 7th century Buddhist relics, through Uzbek crafts such as block printing and silk production, to Russian paintings and sculpture inspired by the European Renaissance. We love photography museums because we like taking photographs and they’re great for ideas and inspiration. Not so much Tashkent’s House of Photography which, while very cheap, had one display of aerial shots of Uzbekistan akin to those you might find in a tourism brochure, and the other two were probably what I’d shoot if you gave me an expensive DSLR for a day – in focus, good detail, but standard subjects, composition and nothing memorable. Still, at only 10p to get in it was worth the punt, and there wasn’t an extra charge for taking photographs. 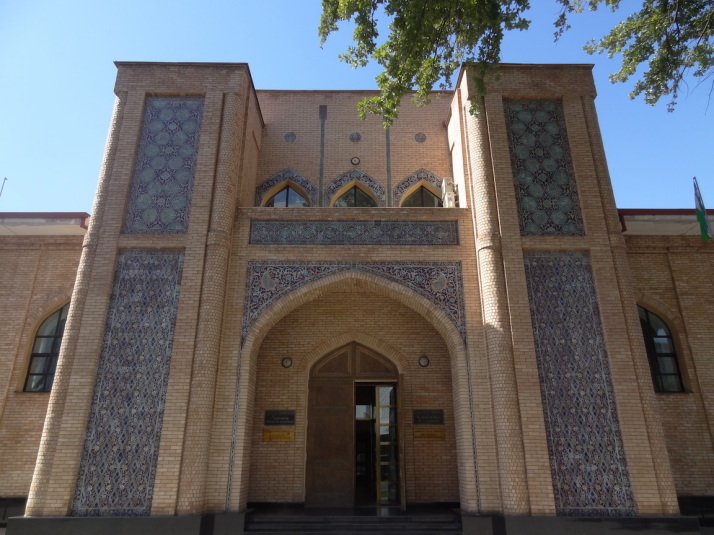 Last on our short list was the History Museum of the People of Uzbekistan, which we were lucky to get into at all as it must be a prerequisite school-trip! 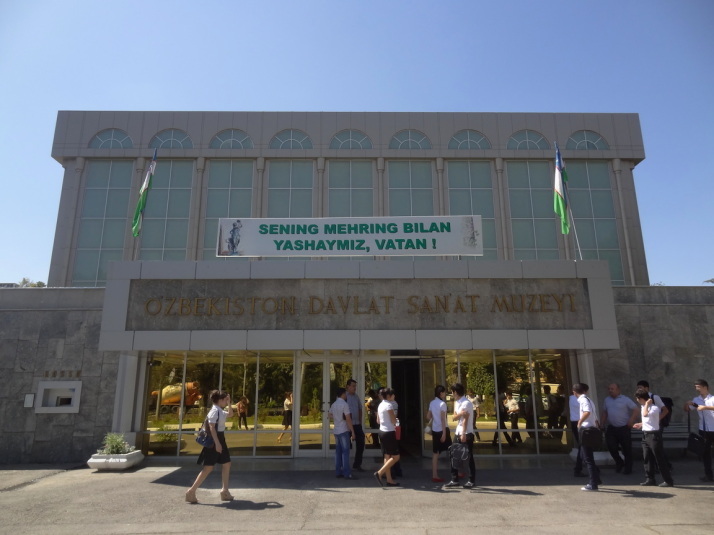 It’s essentially a history museum of Uzbekistan from ancient Turkestan to the present day and, while a little heavy going in places, and a little bereft of English captioning on recent events it was a good over-arching introduction to the people and dates that shaped the country. 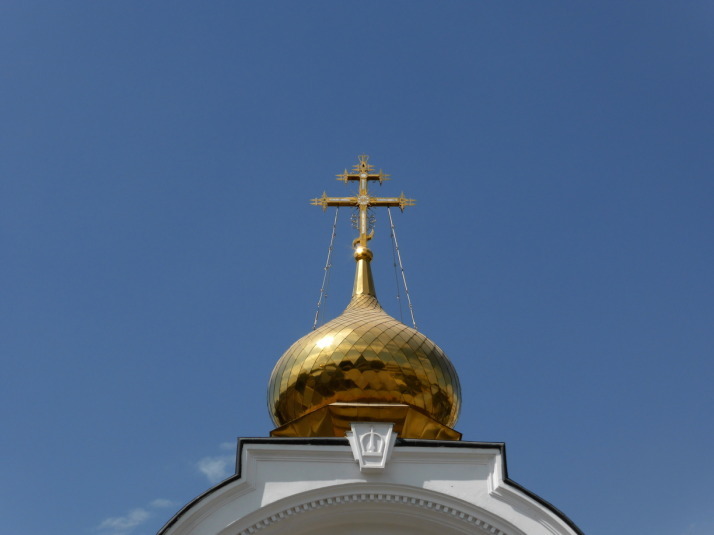 We loved visiting the massive Orthodox churches and cathedrals in Russia, especially the Church on Spilled Blood in St Petersberg and the golden domes of the The Church of All-Saints Resplendent on Russian Land in Yeketerinberg, which we were reminded of when we saw Tashkent’s Assumption Cathedral. 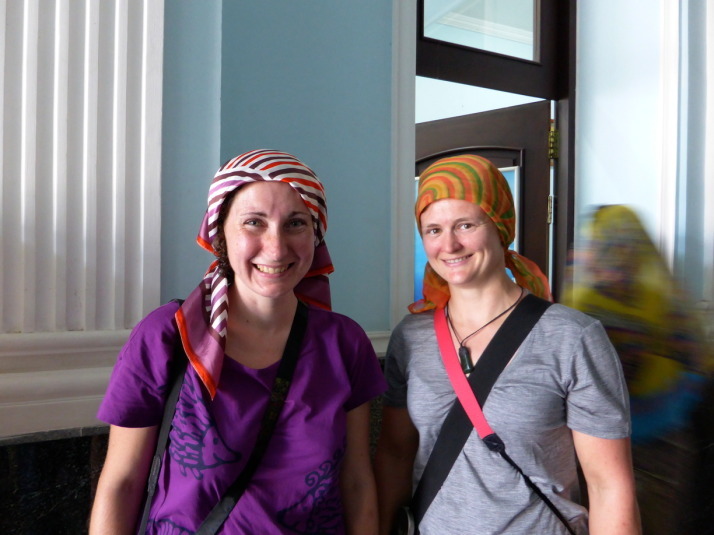 With the balmy weather, Julie and Jo had forgotten their headscarves, but were able to borrow one so we could take a look around inside. We didn’t take any pictures as there were people worshipping, except for one at the entrance.. 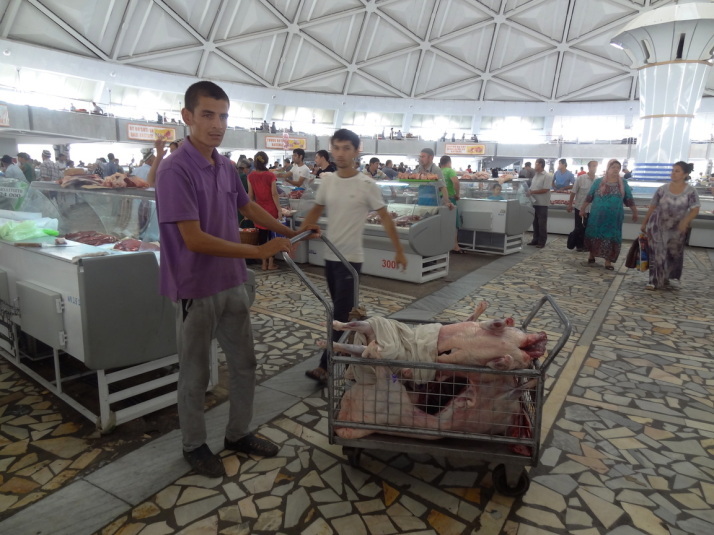 This entry was posted in Places and tagged Church, Market, Museum, Tashkent, Uzbekistan on September 29, 2014 by Andrew. China is the first country that we’ve visited twice on this trip. Last time we were focussed around ancient China with the Great Wall and imperial sites in Beijing, the ancient city of Pingyao and all the archaeological sites near Xi’an, this time we’ve seen some of the country’s more recent history with the Bund in Shanghai and the Massacre Memorial and Presidential Palace in Nanjing. Even after two full months we’ve barely scratched the surface of what China has to offer and we’re certain that we’ll be back. 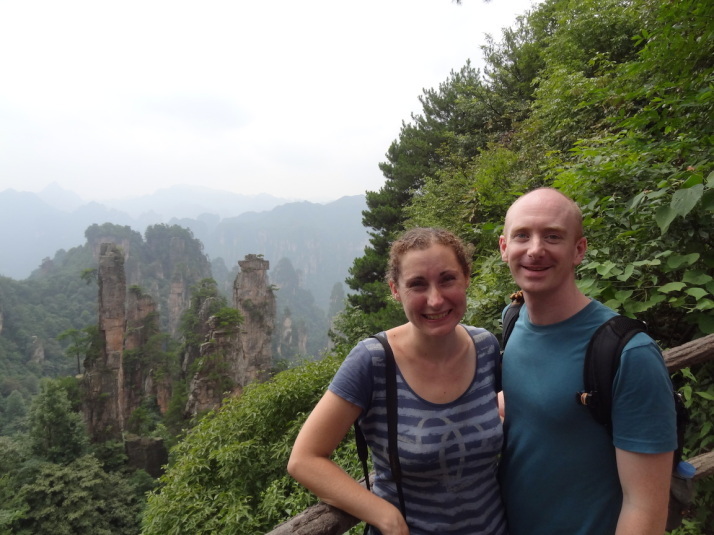 The highlight of our trip through China this time was our three day stay in Zhangjiajie with its breathtaking scenery. Populous – There are 1.35 billion people living in China but the scope of that never really hit us until we came here. Shanghai and Beijing each have around 20 million residents and some of the “smaller” cities we’ve visited (Suzhou, Hangzhou, Nanjing, Wuhan) have 6-7 million inhabitants. To put that into perspective, it’s way more than any city in the UK other than London and even our capital has only 8.4 million. Delicious – we’d remembered really enjoying the food last time we were in China but it was even better than we remember! 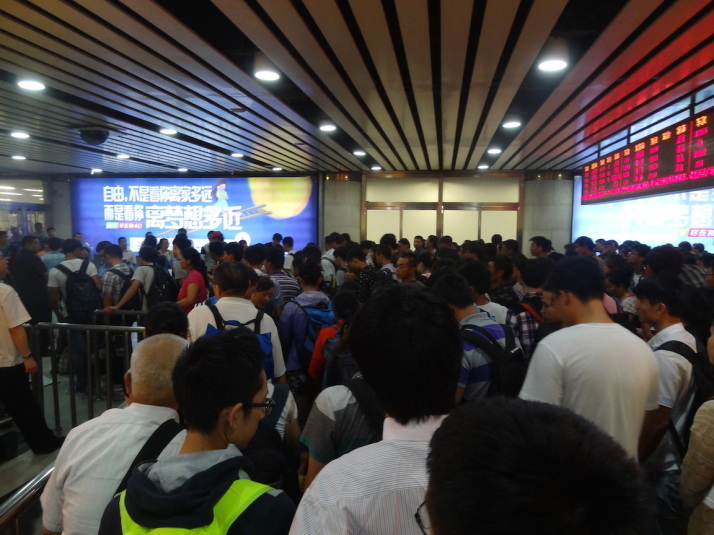 …you’re being jostled and barged when trying to get on or off a train or subway, or through a ticket gate. You know you’ve been in China for too long when you start to join in! A good book and some films on your laptop or tablet to while away the hours you’ll spend on trains. China is so huge that it takes a long time to get from place to place which we don’t mind as we love the chill out time on the overnight trains. This entry was posted in Places and tagged China on September 26, 2014 by Julie. There is no such thing as personal space, people will shove and jostle and stand ridiculously close. Our assumption is that this comes from living in a place with so many others. This ignoring of others extends to stepping in front of someone’s camera, and watching films or playing games on the train with no headphones. All bags need to go through an X-ray scanner at every railway and subway station. There are never enough scanners which can lead to massive pile ups and plenty of jostling, and we’ve seen people walk through without putting their bag in (completely ignoring the protestations of the operating staff). Apart from the obvious guns etc it’s unclear what they’re scanning for as there are no explanatory notices. We’ve seen aerosol cans confiscated but they don’t get them all as my hair mousse is always in my rucksack when moving between cities; we’ve sometimes been asked to take a sip of our water but most times carry through several bottles without comment; and once I had a penknife in my handbag which they noticed and asked to see before giving it back. Although people are scanned as well as luggage at railway stations they’re not on the subway so I don’t think it’s a very effective form of control if someone really wanted to get around it. Babies and toddlers are often dressed in trousers with a large hole around the crotch (and no nappy). To make matters worse, they are allowed to use the street as a toilet. An army of street cleaners do a pretty good job of cleaning up after this as well as the annoyingly prevalent habit of litter dropping. People, especially teenagers, are usually very nervous if required to talk to us. 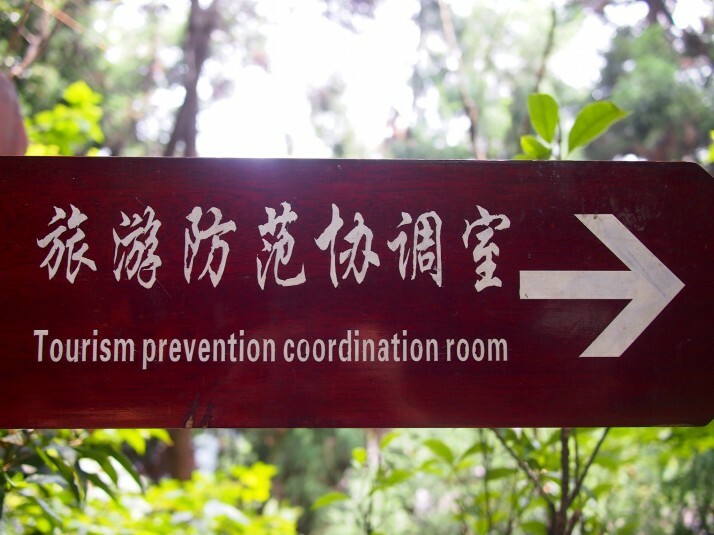 It makes it hard to ask for directions as we don’t know if we’re saying the name of where we want to go so badly that it’s unintelligible or whether the person we’re speaking to is so consumed by embarrassment that they’re not trying to make out our dreadful Chinese. Foreigners are an object of extreme curiosity and we routinely notice kids pointing us out to their parents, adults doing it a little more subtly and legions of cameraphones pointed in our general direction. Andrew likes to call them on it and if he notices someone trying to take a sneaky picture of us he’ll wave at them and then call them over and make them pose with us for the shot – we often heard them burst into fits of giggles as they walked away! 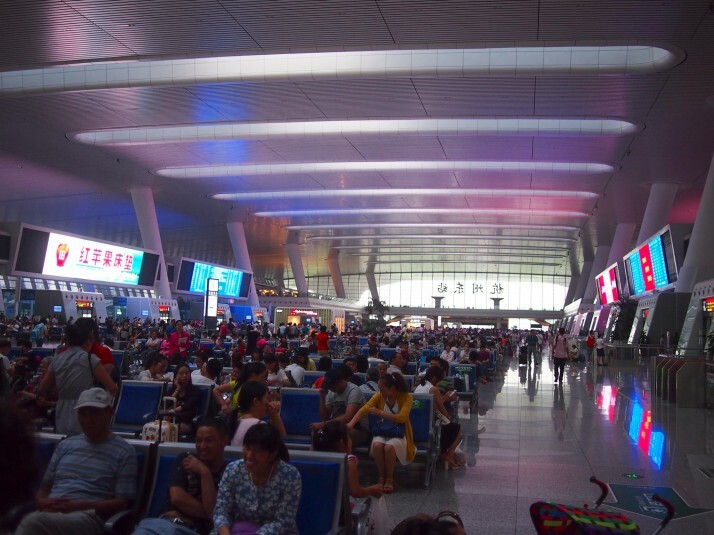 Chinese railway stations are more like airports – the waiting area is a huge open space with numbered gates to the platforms. These are usually opened about 10-15 minutes before the train is scheduled to leave which leads to a scrum (see point 2) to get through the ticket check. Spitting and hawking up phlegm can be heard everywhere on the streets. To be honest the only time it makes us smile is when we remember Mum’s look of disgust which got progressively stronger throughout her two week stay with us last year! Beer is unbelievably cheap – often less than £0.40 for a 600ml bottle (just over a pint) even in restaurants. In South Korea we noticed that young couples often dress in matching outfits (same T-shirts, matching coloured shorts or jeans) which seemed strange enough. In China we’ve noticed families often have matching outfits, for example a mother and daughter will be in exactly the same dress, or even both parents and their child. Whilst in Asia we’ve learnt the fine balance of caution and assertiveness that is necessary to cross the road safely but we have been constantly bemused in China by the prevalence of zebra crossings with green man lights where cars and motorbikes either just whizz through or park across the black and white lines! Much to my surprise, vinegar is a more commonly offered condiment than soy sauce. Stairwell lights in apartment blocks are controlled by noise sensors. We first noticed this when we stayed in Wuhan but it was also true of the block we stayed in Beijing. When the external door swung shut as we left it would bang and turn the lights on so we learnt to stamp our feet if we were in the dark fumbling with the apartment door – so much for not disturbing your neighbours! 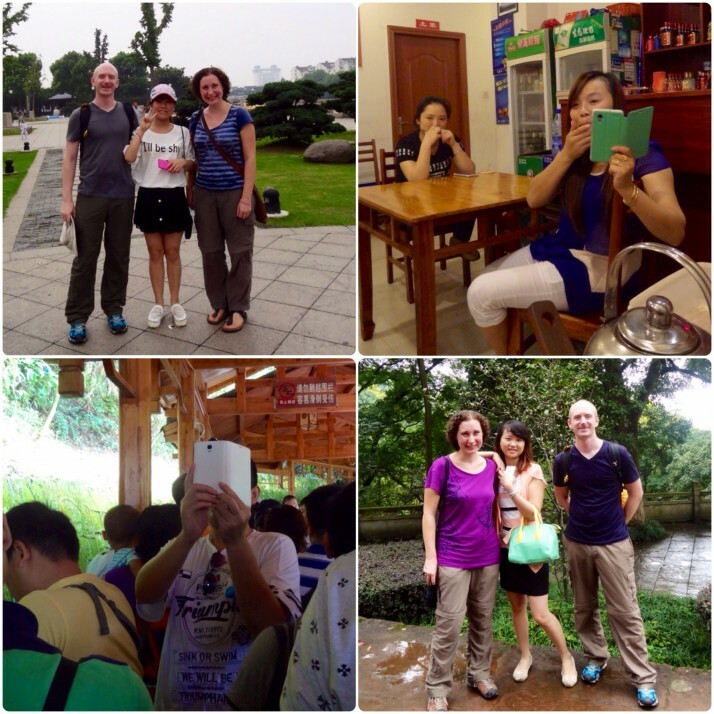 This entry was posted in Experiences, Travel and tagged China on September 24, 2014 by Julie. 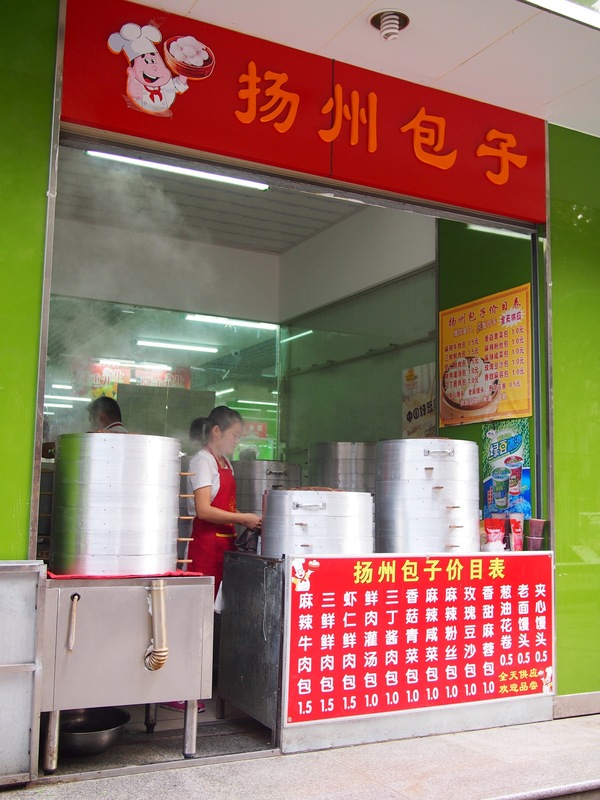 Chengdu is the capital city of Sichuan Province, and made it into our itinerary for the sole reason that back home, my favourite Chinese take-away dish is Sichuan crispy shredded beef. We arrived with two missions, upload the monumental amount of photographs we’d taken in the previous 3 days in Zhangjiajie, and more importantly seek out what is, to my mind, the second best dish in all of Chinese cuisine1. Upon our arrival, we found that our hostel had a free walking tour of Chengdu and after a surreal detour to see a temporary exhibition of 102 Doraemon figures (why?) our tour took us through the central food court area where our guide stopped to recommend the shredded beef.. bingo! 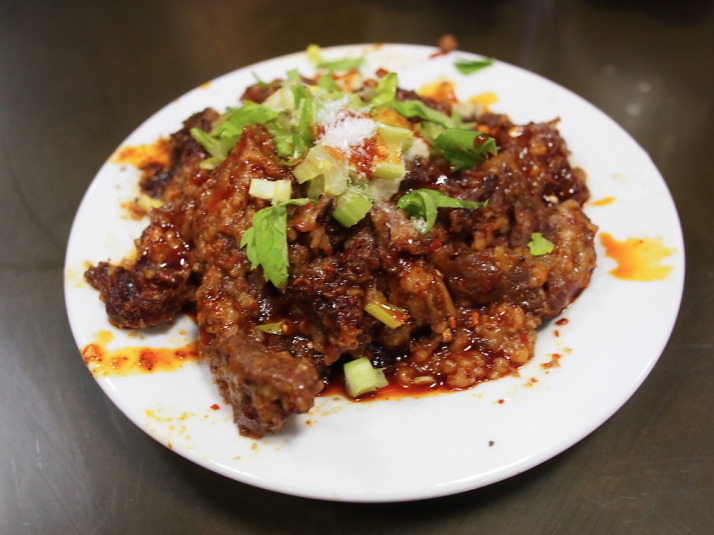 Sichuan shredded beef as presented in Sichuan. Very different, and oh, wait, my mouth is on fire! 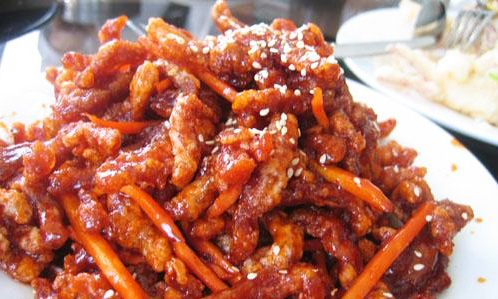 Sichuan cuisine is well known for its spiciness. The region grows its own varieties of the key ingredients used in many of its signature dishes, but one thing we didn’t know before we tried it was that Sichuan pepper has a numbing effect on the mouth. Our guide said this is so you can eat more of the spicy-hot Sichuan chillies. And in case you needed help eating more, the dish is brazenly garnished with Monosodium Glutamate, or MSG. It’s sounding a little less tasty now, isn’t it? After pushing most of the MSG to the side, I can report that the real thing is very spicy (almost rivalling the Korean pot noodles we had in Mongolia), and from the few mouthfuls I remember before I started perspiring and lost the sensation of taste it was excellent. Upon reflection (and a bit of time to regain feeling), I think I enjoyed the authentic Sichuan shredded beef in Sichuan more. The dish at home is often covered in a gloopy, glutinous sauce, whereas the dish in Sichuan (after the removal of the MSG) feels lighter and, well, cleaner, if that’s not a strange thing to say given the aforementioned topping and the numbing sensation. 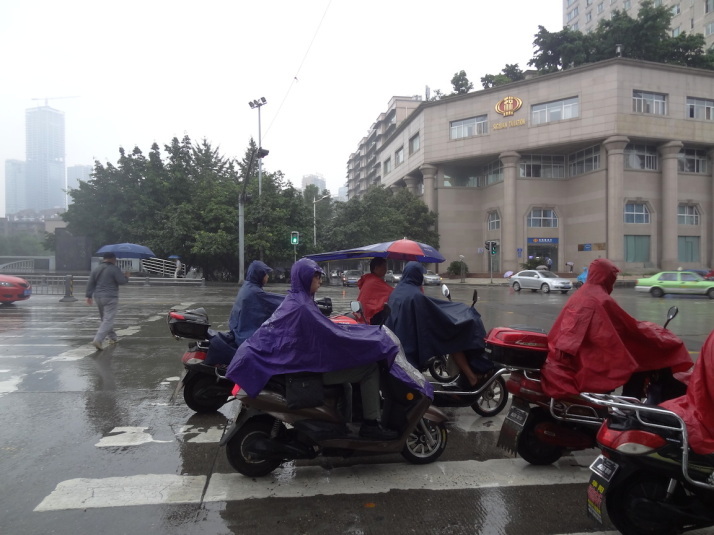 Thankfully, there are plenty of things to occupy our other working senses in Chengdu.. The Aidao Nunnery, small and very tasty! Having read that it was possible to eat with the nuns at the Aidao Nunnery, we headed there with time to spare before the 11:45 commencement. Not sure of where in the Nunnery it took place, or at exactly what time, we only knew for certain we were in the right place because of the amazing vegetarian smells coming from the kitchens around the back. 11:45 came and went, but just before 12:00 we saw a few people helping themselves to two bowls and a pair of chopsticks, so sheepishly we did the same and followed them into the large hall at the right of the complex. After a short prayer (and a little guidance from one of the friendly servers), out came the food – vat after mouth-watering vat was presented and scooped into our bowls until they were almost overflowing. The food was delicious, plentiful, some of it was spicy, and there were 2nds, 3rds and even 4ths on offer! Best of all, it cost an embarrassingly low ¥5 – that’s just 50p! 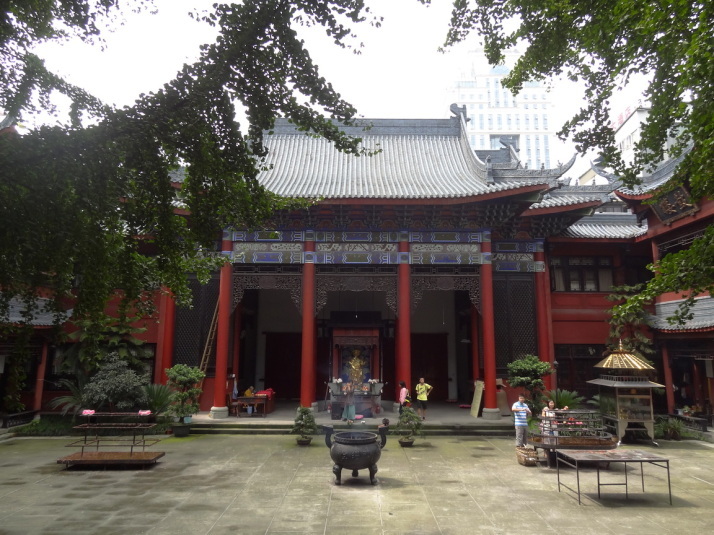 The Shao Cheng Tea House in The People’s Park, Chengdu. Of the 5 tea houses in the park, we chose at random and just happened to pick the cheapest one! Allow me to preface this with a warning about tea ceremonies in China. 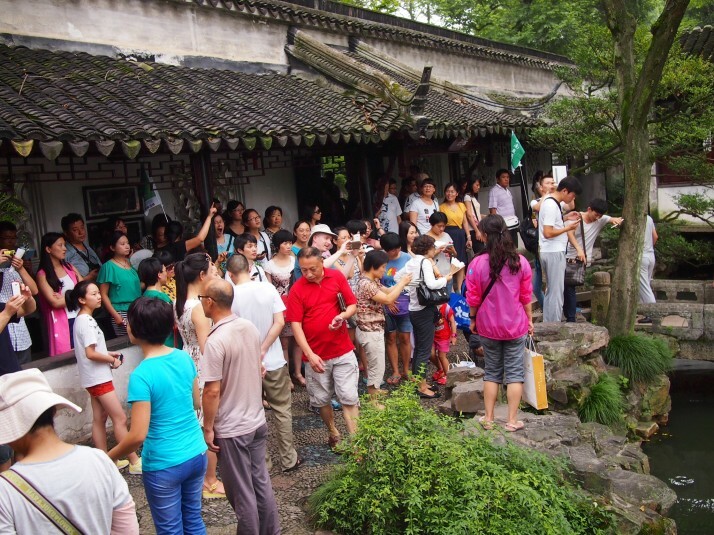 There are a number of stories where foreign tourists are approached in the street by 2 Chinese students who, with excellent English, make small talk and then invite them to take part in a traditional tea ceremony. The tourists do indeed receive tea, but are locked into the building until they pay over £100 or more per cup (and we’ve heard stories that run into thousands of pounds or dollars). 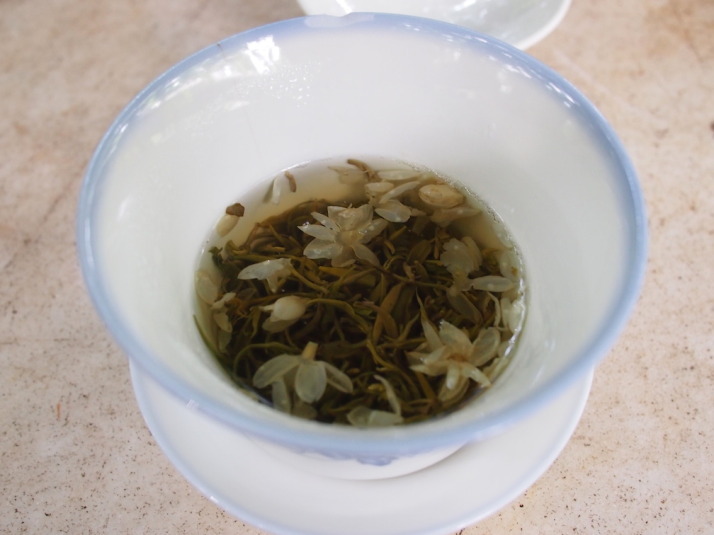 While tea ceremonies are for very special occasions, drinking tea is even more ingrained in the Chinese culture than the British. 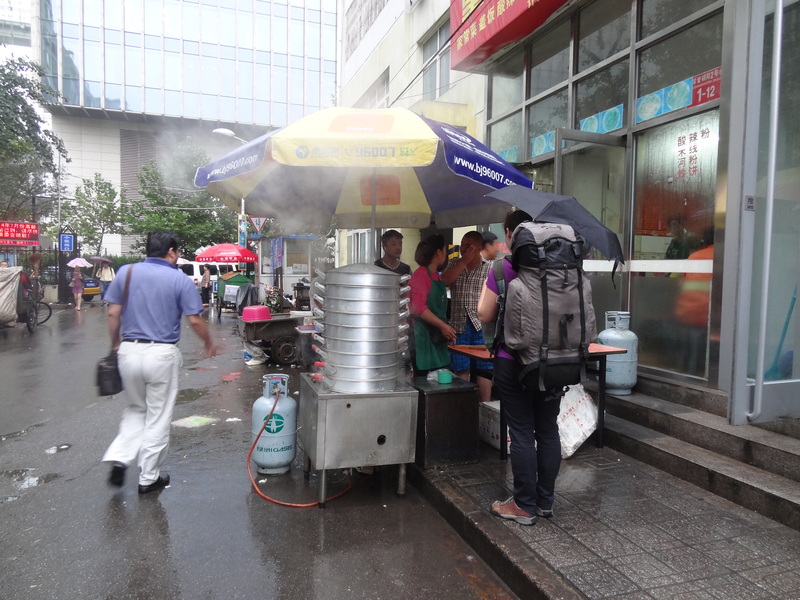 We have seen so many Chinese tourists wandering around with what look like water bottles full of tea leaves, and they routinely stop to top them up with hot water – indeed, the only drinking water flight-side that we saw in Beijing airport was from a boiler for just this purpose! 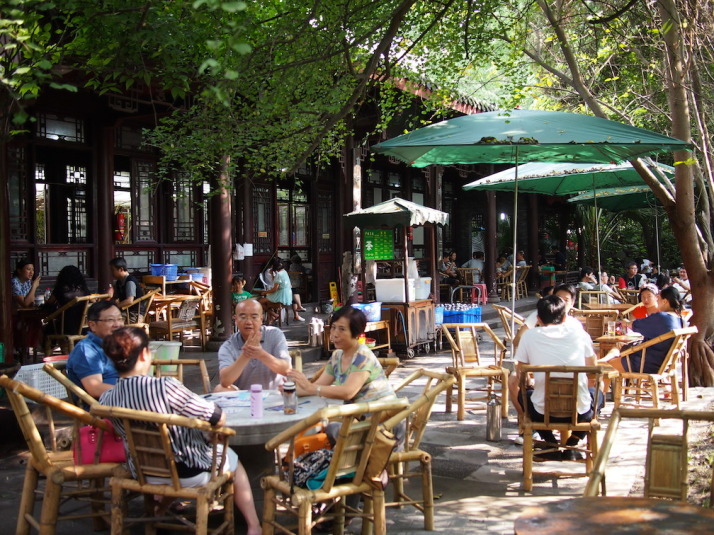 As if I need present more evidence, Chengdu’s People’s Park has 5 tea houses. 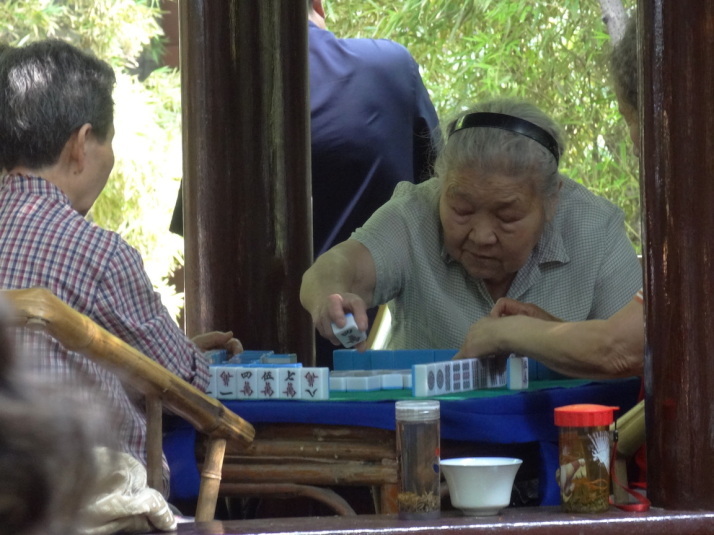 We chose one at random, and were seated at a table next to a delightfully peaceful pond in an enclosed courtyard with only the sound of mahjong tiles and tea cups being placed on the large stone tables. We each chose a different teas from the small, worn, laminated card which thankfully was in English, and soon our tea sachets arrived together with two small cups and a single, large thermos-like canister full of hot water for us to top up our tea with. We spent a very enjoyably relaxing 3 hours in the tea house, at which point the tea was just about the right strength. Had we not been seated next to the fascinating Jeff from California who teaches English to Chinese teachers (and reminded me a lot of my Dad – hi Dad! ), the hours would have dragged as there’s only so much mahjong you can watch everyone else playing when there isn’t anyone to explain how it works! 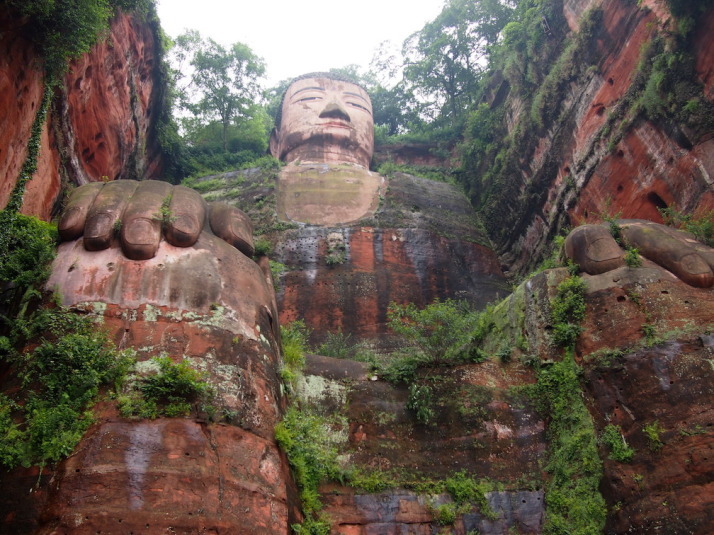 The biggest Daibutsuden or Buddha house in the world is in Nara, Japan, and even if it stood at at its original size instead of the current ¾ it still wouldn’t accommodate the largest Buddha statue in the world – the 71-metre (233 ft) giant seated Buddha of Leshan. 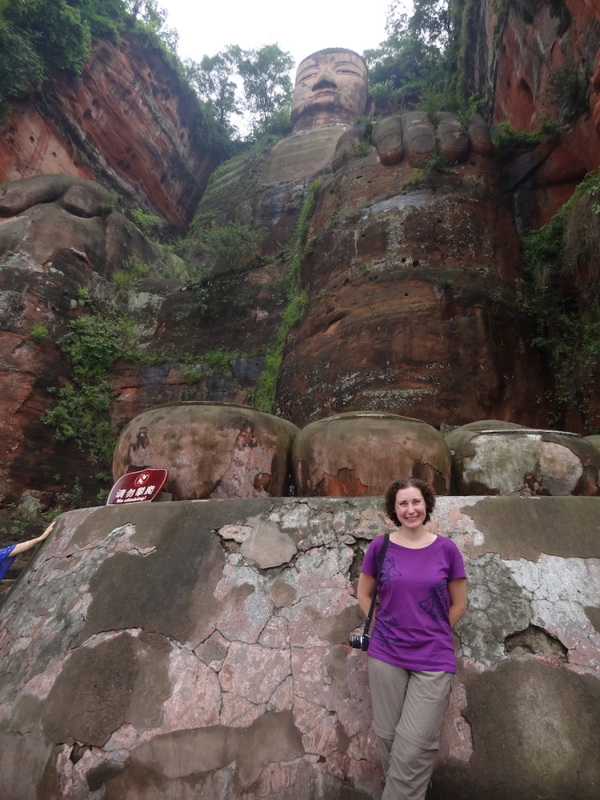 A very easy day trip from Chengdu on public transport, we arrived expecting just the main event and found a park of caves, statues and pavilions on the mountaintop that the Buddha is carved into. 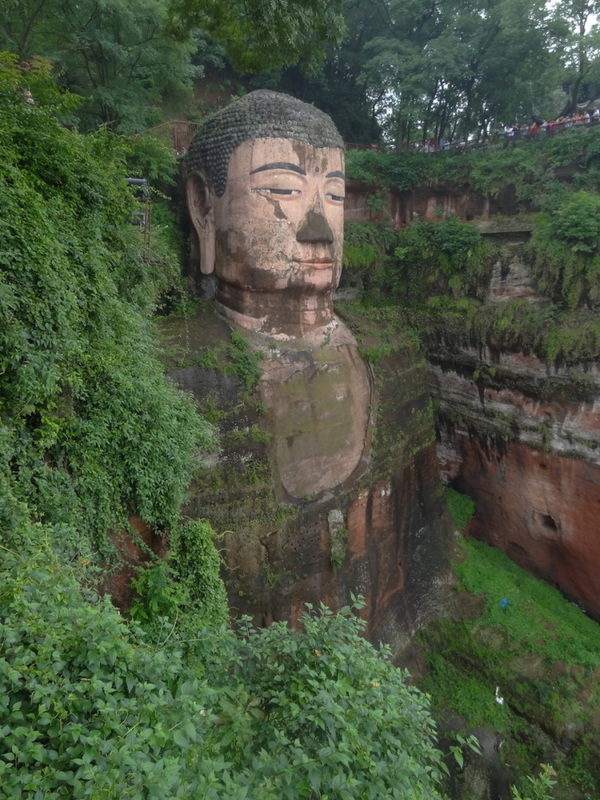 The route starts level with the Buddha’s head, and narrowly twists back and forth as it descends to the small viewing platform at its feet. Niches along the way are carved with Buddhist motifs, and the changing perspective means the queue moves slowly because there’s always another photo to take! 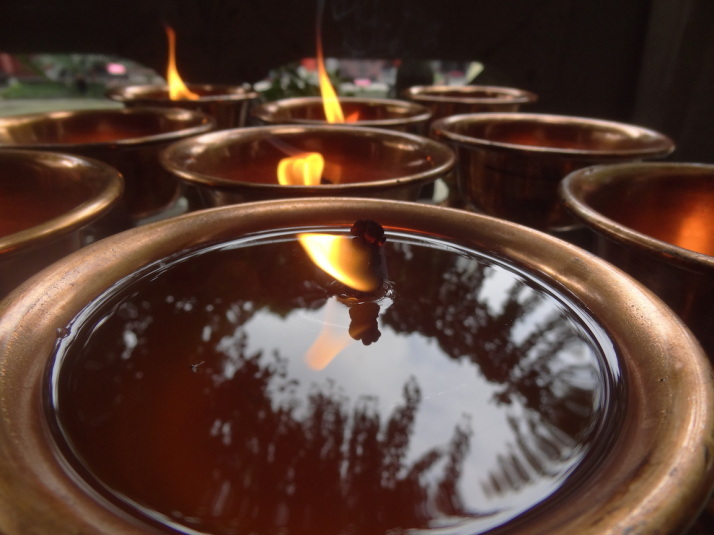 The passageway out was longer than the descent down, and brought us out at the south gate and an unexpected highlight of the day – the Mahao Cave Tombs Museum.. The Mahao Cave Tombs museum is quite small having only 2 rooms of artefacts, but the main attractions are the wonderfully lit cave tombs themselves. 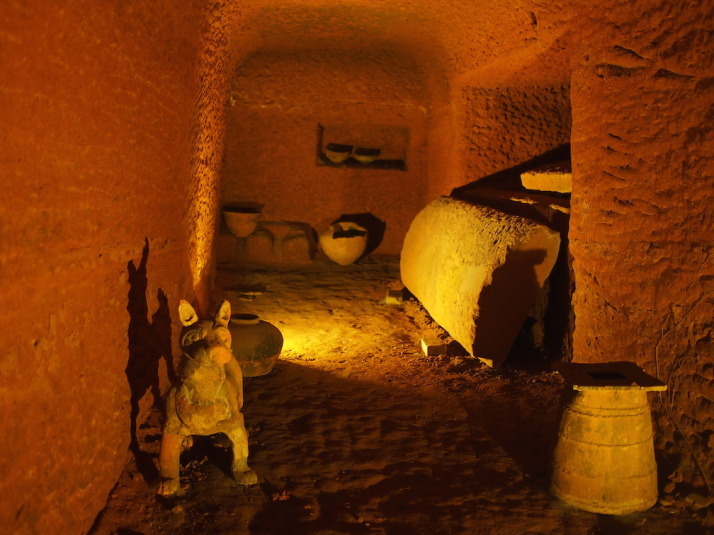 These tomb caves date from the Eastern Han dynasty (AD 25-220) and were built to house the remains of local nobles. A few years before we set off on this trip, I’d seen a short film about face changing opera, where the performers would change their masks so quickly that it was unperceivable to the watching audience’s eye. Having forgotten the name, I had originally recalled this as being a Chinese art, but when we didn’t find it on our first trip to China, I thought it might have been Japanese. 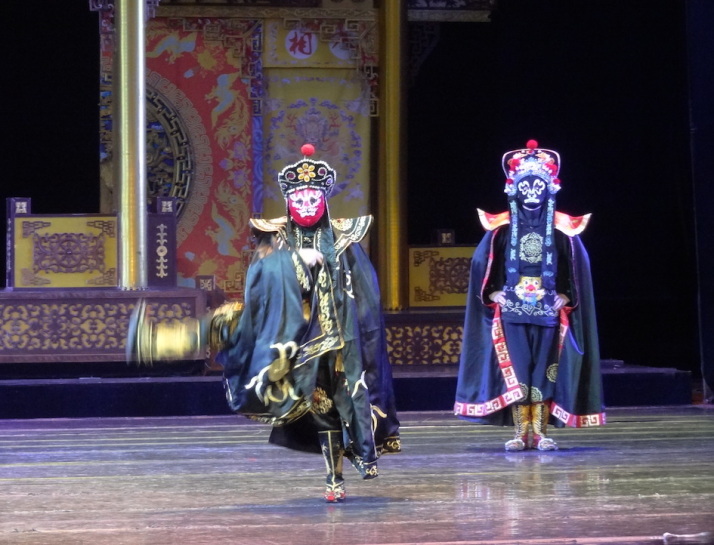 Both China and Japan have an opera style called Noh, and while this does involve mask changing, the changes are done between acts or scenes. 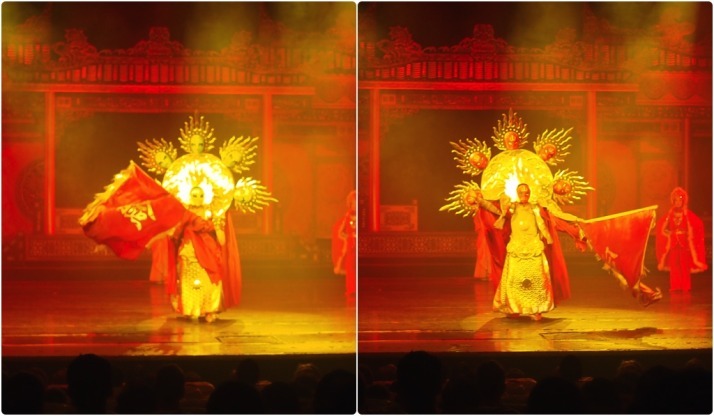 Imagine my delight when we arrived in Chengdu to find a sort of cabaret performance that culminated with Bian Lian – the very mask changing performance I had hoped to find! 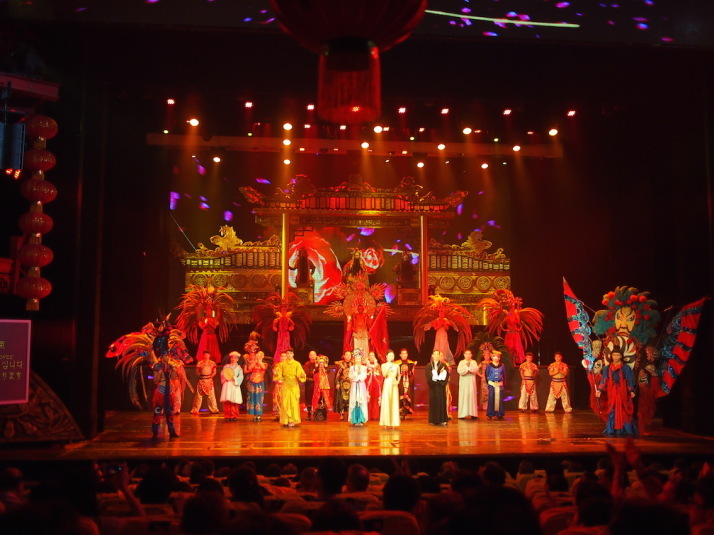 The show we saw is clearly designed for tourists with Chinese and English introductions, a giant electronic subtitle board that almost kept pace with the action, and distinct set-piece acts very much like a mini caberet or variety performance. The highlight for our hostel-organised group was undoubtedly the Bian Lian. Saved for last, 7 artists came on stage and wowed the theatre with their skill and speed. One, after the typical wave of the arm or slight head turn to trigger the change, almost dared us to see how fast he was by looking straight at the audience and simply giving a little skip – we didn’t blink and we still missed it. Audacious, unbelievable and spectacular. As well as ‘normal’ Bian Lian mask changing performers, there was a puppet Bian Lian, and this performer with 6 synchronised masks! 1 What’s the best Chinese dish? Peking Duck of course! 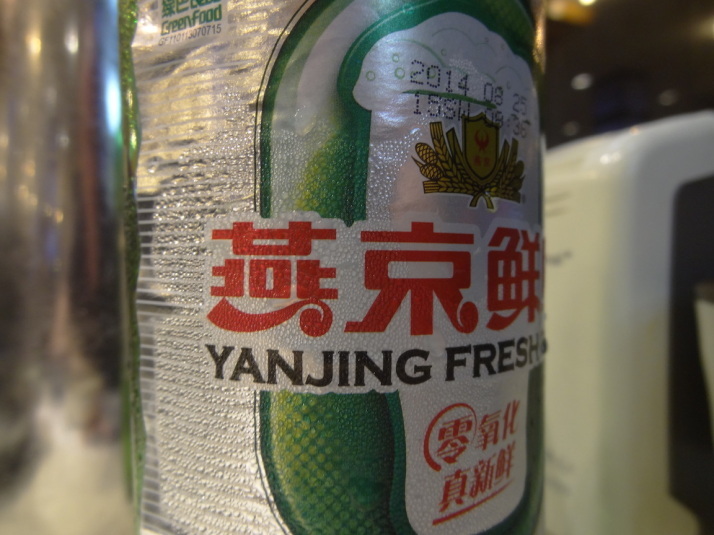 This entry was posted in Experiences, Places and tagged Chengdu, China, Food on September 21, 2014 by Andrew. 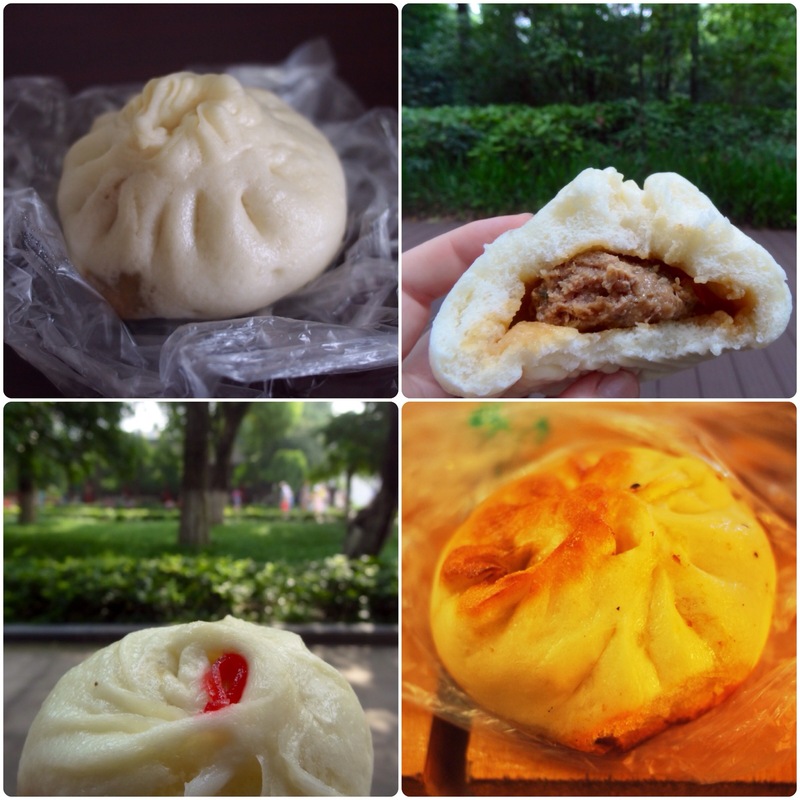 One of our favourite street foods in China are steamed buns (包, bāo in Chinese) and scarcely a day went by on this trip when we didn’t have them for either breakfast or lunch. They’re cheap (around £0.15 each), served fresh from the steamer and easily portable so good for a picnic lunch. The most basic version is a plain piece of steamed dough which is good on the side with a meal but mostly we got the filled buns. There are a variety of fillings, our favourite was a pork mince version which was like a juicy meatball encased in the soft dough. Others include a beef version, spinach and tofu, pork mince with a hard boiled quail’s egg or sweet varieties like red bean paste or custard (a favourite of ours but not available everywhere). 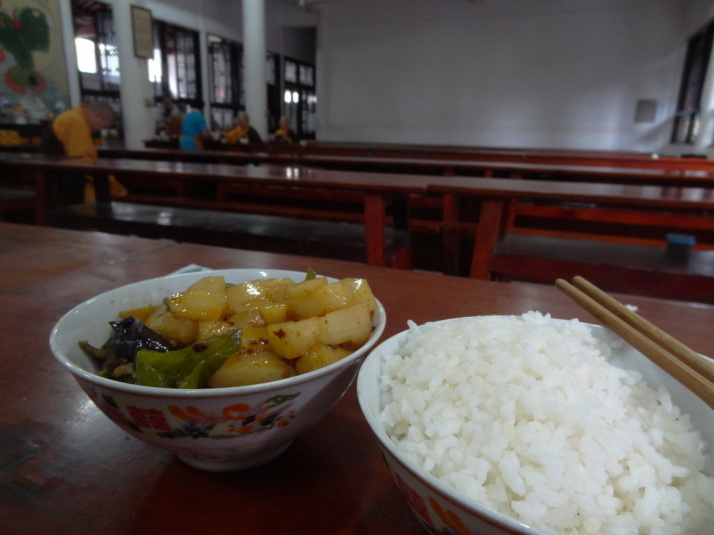 This entry was posted in Travel and tagged China, Food on September 15, 2014 by Julie.